"Since the advance of the Internet professors don't have access to more information than their students. There are still privileges (like being able to take books with you from the library that students are not allowed to lend), but generally students have access to extremely powerful tools to find information to a certain topic: few well targeted keywords are enough these days to find whatever you are looking for. And creates one fundamental insight: There are many things one can imagine that are not on the web, but there is more on the web than anyone can imagine." So, with the advent of blogs and RSS feeds, is the classroom becoming more of the market type (swapping, discussing and enriching information) than the traditional (bird feeding) hierarchy type: From hierarchies to markets as University of California at Berkeley Professor Oliver Williamson would put it? PS: Williamson wrote interesting stuff on why (historically) firms (namely hierarchies) emerged as a substitute to pure market driven transactions. "When I began thinking about the book that is now titled "Small Pieces Loosely Joined," it occurred to me that I should try putting those words into practice. What would it be like to write a book in public? Suppose I were to put up a Web site where people could read each day's writing and talk with me and with one another about it? Problems leapt out. How would I credit people? Suppose people were to circulate passages that I later dropped because I disagree with them or don't like the way there written? How would the publisher feel about my in effect publishing the book on line for free? All of those were, of course, ways of avoiding the central problem: I'm embarrassed to show first drafts to people. I write by throwing stuff down on the page, letting it sit, and then editing ferociously. I frequently throw out beginnings. I usually do large block swaps. And I always always always introduce typos, grammatical errors, thinkos and infelicitous phrases. All of these would be in public view. Ack. In return, I'll get great ideas, will be steered away from embarrassing intellectual lapses, and will turn readers into collaborators. I begin this venture with deep fear. We shall see. " Want to know more: Go to the smallpieces website. You'll find Weinberger's blog too. André Frossard, who passed away in 1995, had a rather unusual life. The son of the first General Secretary of the French Communist Party and of a Protestant mother, grandson of a Jewish grandmother, converted to catholicism in 1935 (after a sudden revelation), he joined the French resistance during WWII, was captured by the Nazis and was among the seven survivors of the Bron massacre perpetrated in Bron by the Gestapo in August 1944. He was a prolific writer, journalist, novelist, a close friend of Pope John Paul II and was famous for his great sense of humor. Last but not least, he was elected to the French Academy. "Well, faith is what allows reason to live above its means." Don't you think this is a truly deep thought? Indeed, this could become the motto of most entrepreneurs! "Men wanted for Hazardous Journey. Small wages, bitter cold, long months of complete darkness, constant danger, safe return doubtful. Honour and recognition in case of success." From Leading at the Edge : Leadership Lessons from the Extraordinary Saga of Shackleton Antarctic Expedition by Perkins, Dennis N. T.(Author) Saranac Lake, NY, USA: AMACOM, 2000. Page 2. "Who in the world would volunteer for this journey?" asks Dennis Perkins. "Amazingly", he says, "thousands of would-be explorers came forward, each wanting to join Shackleton’s expedition." But, what was exactly this expedition all about. Well, as a matter of fact a rather scary one. As shown in the map, Shackleton’s mission was the first overland crossing of the Antarctic Continent. 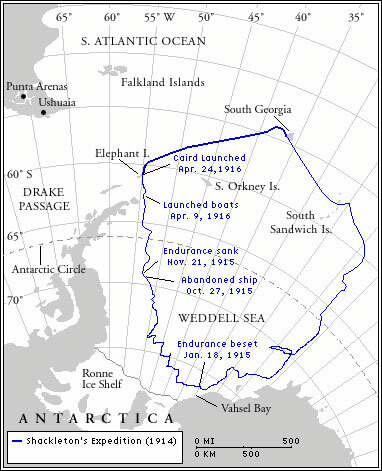 According to his own computations, Shackleton believed that he and his team could complete the transcontinental journey in 120 days. Ice everywhere, huge crevasses, darkness, extremely low temperature, in a nutshell a trip not for the timids! Shackleton was already a famous explorer who had come within ninety-seven nautical miles of the South Pole before he was forced to turn back because of physical exhaustion and a shortage of food. To complete his journey Shackelton selected a ship which he named The Endurance. To make a long story short, things did not go the way Shackleton expected them to go. The Endurance was swallowed by the ice and it took Shackelton and his team 634 days to go back to civilization. Everybody, of course, thought the whole crew had perished. I urge you to read this story. This is a truly moving story. You'll learn how Shackleton coped with this terrifying situation and how he kept to his promise to bring the whole crew back to civilization alive. This book is a must have and a must read. In particular, it should be part of the required reading list of any entrepreneur. There is no way you are going to look at things of life the same way after reading this leadership account of Shackleton's odyssey. This is a true lesson on entrepreneuring at the edge, on making decisions in an hostile environment, on having to cope with mutiny, on managing expectations, on defeating despair, on regaining hope despite having all the odds against you. At Cyberlibris, we also face a lot of challenges: We perspire a lot! This is precisely when Ernest Shackleton is a source of inspiration to us. We ask ourselves: What would have he done (other things being equal of course!)? It is always a good thing to go back to classics. A genuine source of inspiration. I am currently re-reading Adam Smith's "The Wealth of Nations". This is the one published by Bantam Classic (2003) with a nice introduction by Princeton University Professor of Economics Alan B. Krueger. Smith starts with a careful analysis of the division of labour. I did not realize that he had spent a lot of time visiting factory floors before starting to write. To put in Krueger's own words, "leaving the classroom and visiting the factory floor paid immeasurable dividends for Smith's analysis, a lesson that is often lost on modern economists." Interestingly enough, Krueger mentions that the National Bureau of Economic Research (the famous NBER) has organized factory floor visits in many industries to "expose academic economists to the workings of the modern factory floor." As a tribute to Smith, these visits are nicknamed "pin factory" visits. Nice initiative indeed, although I am still wondering how many scholars do enroll this "anti ivory tower" program. Management and management education are in deep trouble. According to Henry Mintzberg, "conventional MBA classrooms overemphasize the science of management while ignoring its art and denigrating its craft." Mintzberg calls for "a more engaging style of management, to build stronger organizations, not bloated share prices." "Describing the world may be thought of as an Olympic contest between simplifyers - scientists in general, statisticians in particular and complicators - humanists in general, storytellers in particular. It is a contest both should win." Don't you think that more often than not business schools teach that only one side should win? Blogging from 7 to 77 years old! If blogs had been available I am pretty sure that Tintin would have been blooging like crazy. So would have been Professeur Tournesol! As a matter of fact, this tells you one thing: As Hergé would have said one can (and one should) blog from 7 years old to 77 years old (and even beyond). In a sense, young people have a lot to "vocalize" and older (retired) people have a lot to share and a lot of time to share it. Of course, blogs cannot do everything but there are a few things that they are truly good at and this is one of them: Breaking the "age wall". By the way, welcome to a new blog dedicated to the management of change and, guess what, this is a blog from Algiers (Alger). MDI Alger is a Business School located in Algiers which is, in particular, very active in the field of executive education. Their aim is to make sure that the fruitful exchanges that get started when managers are on campus still blossom when managers are back in their offices. We are proud of the achievement as MDI-Alger belongs to the Cyberlibris community! Let's blog and roll business schools!!! Are European business schools "blogging" behind? It seems to me when I look at the US that indeed European B-Schools have not boarded the blog fast train yet. What a pity! Look at Harvard , Stanford, Kellog at Northwestern, Wharton and I could go on like this forever. It's time to wake up and to "blogalize" our business schools! Who wants to join us? I just read a very good article by Sandeep Junnarkar in the International Herald Tribune entitled "Illegal downloaders look beyond music to books." It starts like this "Early in his undergraduate years at Indiana University, Joseph Ruesewald said, he had trouble finding the required titles for a couple of his classes at the local bookstores. When he tried ordering the books online, he learned it would take too long for delivery. Having come of age in the era of Napster, Kazaa and other file-sharing networks infamous as bazaars for pirated music, he knew exactly how to obtain the books - if not in his hands, at least for his computer's hard drive." In a sense, all this boils down to Prohibition time. When alcohol was prohibited in the 20s in the US, a lot of people found it "optimal" to have an alambic in their bathroom! Today the alambic is called Kazaa, eDonkey, eMule... and people find it "optimal" to have it and to use it! Why? Andy Grove, Intel co-founder and chairman, was wondering a few years ago why the content industry would not listen to what was obvious (as he put it) to the ponytail guys. Indeed, if people don't get value for money and have powerful technologies at their disposal, they'll find a way out: "A fundamental rule in technology says that whatever can be done will be done." And, this is exactly what the so-called pirates are telling us. Answering them calls for new business models, patiently crafted, to match their opportunities/constraints set. This is what we spend hours working on at Cyberlibris. We believe we have come up with a business model which somehow aligns goals that seemed to be conflicting. In the course of doing so, trust among the various stakeholders is regained and the dividends of a new virtuous circle can be reaped. Be sure that we are going to continue polishing the model with you and with growing passion! Myopic, did you say myopic? This entry is a sequel to a previous entry which was arguing that financial markets may not be short-sighted after all. Well, allow me to go one step further. I was watching the news the other day. The journalist was reporting on a jewish student who was agressed against by some unknown fellow. To my surprise, even though nothing more was known, the conclusion was that it was a racist agression perpetrated by some muslim activist. Anti-racist activists, politicians (chasing some more votes) immediately denounced a racist plot and called for action and protestation just to discover a few days later that the culprit was a mentally ill person. I could quote dozens of examples like this one which all tell us that society has indeed become rather short-sighted. So, when people complain about myopic financial markets, they should first look around them and may be listen to financial markets. There might indeed be two or three lessons that financial markets could teach them!